This is the public profile of Kimmo Wihinen, Additional information and high-resolution images are available for accredited press members, to access additional information about Kimmo Wihinen please login as a press member. Red Dot Winner 2016 for Valtra T-Series. 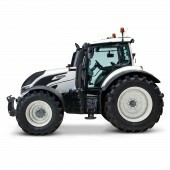 Golden Tractor for Design 2016 for Valtra N174. The achievement was to manage the industrial design processes and to ensure the final product fulfills all the required functional and visual attributes in high quality fashion. Press Members: Request an exclusive interview with Kimmo Wihinen.